Haier ranges come with High quality porcelain on multiple panels that provide a classic appearance and will stand the test of time, resisting rust and cracks. Safety features, like the anti-tip bracket, protect you and your family from dangerous kitchen accidents. And with so many easy-to-use features, this range can make a novice into a master chef in no time. Most models ship immediately. making it both durable and attractive. 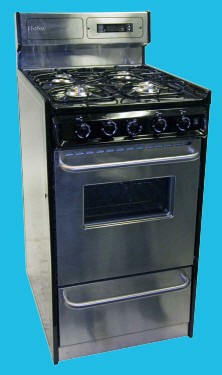 30" Electric Range Coil Burner, Window, Stainless Door and Back Guard. LED controls and a stainless steel body make this oven modern and attractive. 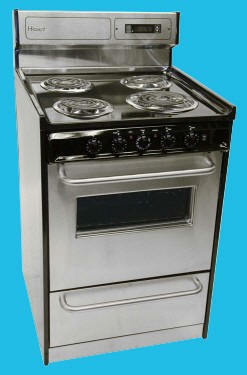 24" Electric Range Coil Burner, Window, Stainless Door and Back Guard. 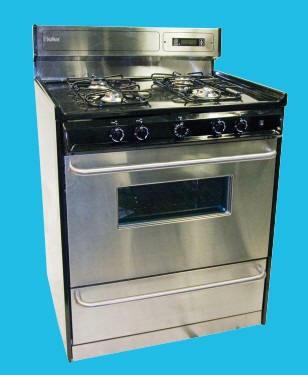 This stylish black and stainless steel range will be the eye-catching centerpiece of your kitchen. 20" Electric Range Coil Burner, Window, Stainless Door and Back Guard. With the broiler pan, grill, oven and stovetop in this range, you can cook anything to perfection. 30" Electric Range, Coil Burner, White. This feature-packed electric range will make cooking a joy. 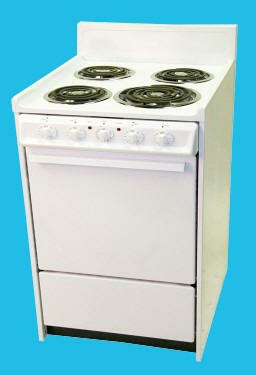 24" Electric Range, Coil Burner, White. This smaller electric range is perfect for apartments or small kitchens, and is still large enough to cook meals for the whole family. 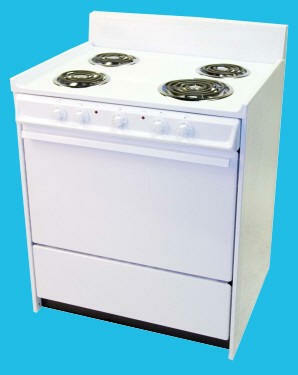 20" Electric Range, Coil Burner, White. All ranges ship via Motor Freight Trucking for $145.00 - $195.00, depending on weight.